ST. GEORGE – Police arrested a man Wednesday in connection with a shooting incident that occurred Wednesday morning at a home on Diagonal Street in St. George. 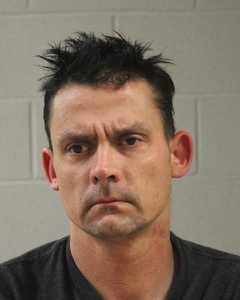 Edward Dryden Clark, 40, of St. George, was charged Wednesday with second-degree felony aggravated assault for his role in the altercation, which took place in an upstairs rental unit on Diagonal Street. Police responded to the 200 West block of Diagonal Street Wednesday morning on reports of gunfire in the area after neighbors reported hearing a single gunshot coming from a residence and seeing two vehicles leave the residence very quickly, St. George Police Officer Wyatt Miles said in a probable cause statement supporting Clark’s arrest. When officers arrived at the scene, they located a bullet hole in the exterior wall of the residence that was consistent with an exit hole from a firearm, the statement said. Officers were able to make contact with the homeowner. The homeowner told police he lived at the residence with his nephew, whom he allows to stay with him on occasion, according to the statement. The homeowner told police that his nephew had Clark and another friend come over to the house early Wednesday morning between 4-5 a.m.
Clark and the other man left the home at one point and then returned as the homeowner was leaving for work. Shortly after the homeowner left for work, Miles said in the statement, he received a call from his nephew saying Clark wouldn’t leave the residence and was causing problems. The homeowner went back to the residence to confront Clark, who was sitting on the front porch bench, according to the statement. When the homeowner yelled at him to leave, Clark pulled out a handgun and threatened to kill the homeowner. The homeowner told police he was able to de-escalate the situation right after and that he let go of Clark’s gun. As Clark and his friend were leaving, Clark turned back around and again pointed the gun at the homeowner, according to the statement. When police located Clark and questioned him about the situation, Clark admitted to being at the residence with a handgun and that an altercation took place between him and the homeowner over the gun. Clark was arrested and booked into the Washington County Purgatory Correctional Facility. His bail pending trail stands at $10,000.